Will The New Starlite Ferry And Oroquieta Stars Battle In The Future? 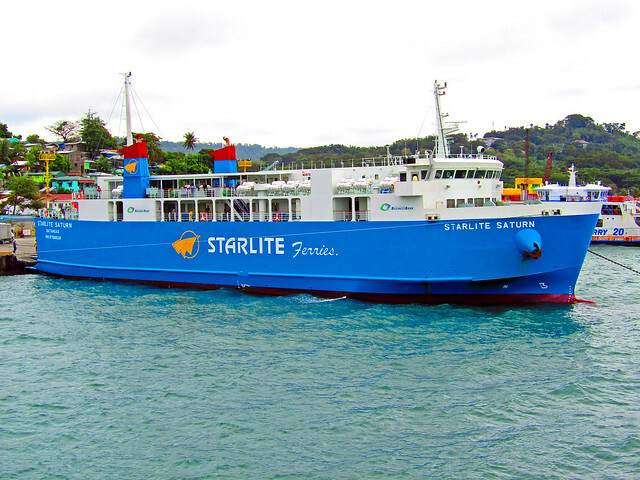 It has been announced in the news a few months ago that Starlite Ferries of Batangas send a ship of their to Ormoc, the premier gateway to Leyte from Cebu. Many know that the Cebu-Ormoc is a high-density route. However, at the time this article was written (May 2017) no new Starlite ferry has arrived in Ormoc. I do not know but maybe they are serious but they could still be awaiting a ferry from Japan that has overnight accommodations, i.e. equipped with bunks and maybe cabins too. Starlite Ferries must have realized by now that the stronger schedule to Ormoc is the night sailing and not the day voyage. Meanwhile, Ormoc is a very important route for Roble Shipping and for sure they will not take a challenge there lying down. Currently they are using their bigger but older ferries in the Ormoc route and primarily this is the Joyful Stars, the former Cebu Princess of Sulpicio Lines. This ship might have been a former liner and hence has better accommodations than the usual overnight ferry but she is already old although not yet obsolete or unreliable. But people and passengers have a bent for taking the newer and more modern ferry and so if the new Starlite ferry arrives the Joyful Stars might have a hard time coping. I and many other members of PSSS (Philippine Ship Spotters Society) have been wondering why the new ship of Roble Shipping, the Oroquieta Stars which is the former Taelim Iris has been staying long already in the Hilongos route when according to press releases of Roble Shipping before she is destined for the Oroquieta, Misamis Occidental route and hence the name of the ship. We thought at first she was in Hilongos to “acclimatize”. But over half a year has already passed and she is still there. Now I am thinking, is she actually waiting for a future competitor that got Roble Shipping’s attention? I am guessing that if finally Starlite Ferries serves the Cebu-Ormoc route then Roble Shipping will transfer the Oroquieta Stars to this route to do battle. And if this happens, I expect a good battle between them. This will be a good fight between a surplus ship that is not yet old with new interiors versus a ferry that is completely brand-new. That will be a good test if a brand-new ferry really has an edge in a head-on fight. After all, the owners of the brand-new ships tout that they have the edge. An actual fight will prove if that is really true and I and PSSS will be glad to see if they can prove it. In size the two ferries will be a near-match. The new Starlite ferries are nearly 67 meters in LOA (Length Over-all) on the average. Meanwhile, the Oroquieta Stars has an LOA of 77.4 meters but in LPP (Length Between Perpendiculars) she is only 68.0 meters versus the 63.3 meters of the new Starlite ferries. The reason for the big difference in the LOA and LPP of Oroquieta Stars is she has a long bow. In estimating capacity, the LPP is more important than the LOA and so in LPP their gap is just 4.7 meters which is just the length of a sedan or an SUV. In Breadth, however, the new Starlite ferries has a big edge at 15.3 meters versus the 12.0 meters of the Oroquieta Stars. This difference is actually one lane of vehicles and so the new Starlite ferries will probably carry more vehicles and ROROs earn more from vehicles compared to passengers. But then I would add early that Oroquieta Stars has a “homecourt advantage”. There are vehicles practically locked to them, they have been long in the business connecting of Cebu and Leyte and hence they know more people and customers and they are also good in offering low rates which is actually the primary decision point of those who decide loading of vehicles. In passenger decks, both ships have two decks and so in passenger capacity they will not be far from each other, theoretically. But Roble Shipping is known for offering hard fiberglass seats on their routes and these maximizes passenger capacity and so probably in this category the Oroquieta Stars will have a dubious edge. These seats is what I call the “cruel seats”. Imagine sitting on them for 5 hours on the average for a just few pesos less than the fare charged for a bunk. In terms of comparison of cubic capacities of the ship in Gross Tonnage and Net Tonnage, I do not want to use them because such comparisons are usually meaningless in the Philippines because if there is “gross” it is because the declarations of them are grossly inaccurate in many cases. And besides the ship with a deeper keel will have a higher Gross Tonnage. By the way the new Starlite ferries are touted to be more stable because of its large Depth which is 9.4 meters. However, the Oroquieta Star’s Depth is nearly like that at 8.1 meters. Regarding engine horsepower, the Oroquieta Stars have a significant edge at 4,900 horsepower versus the 3,650 horsepower of the new Starlite ferries. This is the reason why the former has a higher design speed, the speed that can be sustained when new at 16 knots versus the 14.5 knots of the latter. In an evening voyage this metric will not matter much since Ormoc is just some 60 nautical miles from Cebu and so it will just be a matter who arrives earlier in an unholy hour. In Ormoc at this hour there are no good connecting trips yet by land. In Cebu it might matter a little because buses leave at all hours of the night. But in daytime this will be an edge for Oroquieta Stars. Plus of course bragging rights are always associated in being the faster one. And maybe the prestige of the new Starlite ferries will suffer a little because newer ships are supposed to be faster. But then those who know better knows speed is simply a function of the engine power. Even though Oroquieta Stars is already 23 years old, I think she will still have a slight edge in speed although forcing older engines always carries a risk. In mechanical reliability though, the ROROs built in the 1980s and later have proven they are still very reliable at 30 years of age or even greater. In interiors a newly-refurbished ship is almost as good as a brand-new ship especially in the particular case of Oroquieta Stars which was converted from being a vehicle carrier. That means a lot of the accommodations are actually new. And if there is enough power from auxiliary engines then there is no reason why the air-conditioning of a ship would be weak. In passenger service, well, it is proven that graduates of hotel and restaurant courses are better than nautical course graduates as the former have a lot of edge in training with regards to that. Whoever invests more in this will be the winner. If one is as good as the passenger service of 2GO or FastCat then they will probably have an edge. But if one just relies on cadets or apprentices, they will be a sure losers. They might be too cheap (as in they work for free) but I find them rough in the main and at times uneducated. In the food service, whoever invests more will also be the winner too. The parameters here are the taste and variety. Actually what I found tasty were those who offered microwaved freeze-dried food because those are food that were actually standardized and tested. That is unlike the carinderia food which are always highly variable in quality and taste. Of course none will probably be able to offer the extras of the true liners of 2GO (I mean not counting the former Cebu Ferries). But knowing Pinoys, if one will offer unlimited rice that will be a certain edge. I imagine if the two will face off it will be a tight fight. Can the new Starlite ferry prove they really have an edge? Actually I doubt it. They might be more thrifty on fuel and needing less parts and service but they have a higher amortization because brand-new ships are not cheap and all were acquired through loans. In a straight fight with discounting the brand-new ships will have a hard time. Actually to say the new Starlite ferries are better against the likes of Oroquieta Stars is just like saying it is better and hence by implication will best or defeat the former Cebu Ferries of 2GO and that is actually hard to prove as everybody knows. That is what I mean that good second-hand ferries that were refitted well and has good maintenance and has very well-trained service personnel can easily match a brand-new ship. And this will probably point to the weakness of the new Starlite ferries. They are new but they have no technical or technological edge versus the ferries built in the 1990’s like those used by 2GO. This is not like in buses and planes where a 20-year bus or plane can’t compete with a new one. If new ferries will have an edge it will be against ships that are already over 35 years old. And so this might not be yet the time the new Starlite ferries will have an edge over the Oroquieta Stars. Whatever, these are mainly theoretical yet. What I want is a true test so conjectures and analyses can be proven or disproved.